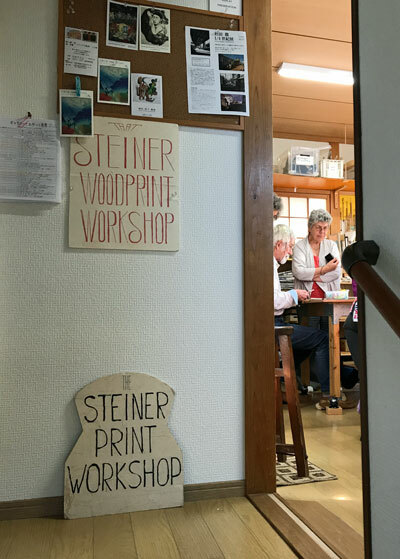 Learn how to make Japanese water based woodblock prints in Kyoto with Richard Steiner, highly respected teacher and mokuhanga artist. "The traditional Japanese technique is highly versatile, environmentally friendly and inherently beautiful. The school follows, to an extent, the ukiyo-e method, but is solidly in the Independent Printmaker Tradition. We strictly follow the difference between being an artist and being a craftsperson. "You can study for a short or long term. The very short courses, however, have been dropped. No more one-day, three-day one-week classes. The lengths available now are ten-day, two-week, one-month, three-month, one- or two-year courses. These year-long courses end with a teacher's license and an artist name. There are no classes on weekends or Fridays. Classes begin at 1:30pm and end about 6:00pm after a studio clean up. NEW: The mid-week day off, Wednesday, is now changed to Fridays. This will give students a three-day weekend to see more of Japan and Kyoto. Courses for 2017 and 2018 are all booked. 2019 still has openings. But they are few because of preparations for my 50 Years of Printmaking exhibition in 2020." Tadekura-cho 65-6, Shimogamo, Sakyo-ku, Kyoto; zip code is: 606-0806. The building is bigger and much brighter. The area is more quiet than the previous location. The Takano River is very close, as is the Shimogamo Shrine. Let me give you some information about how we work here. Classes begin at 1pm and end at 6pm after a workshop cleaning up. There are no classes on weekends or Fridays. The daily fee is ¥10,000 and includes your wood, proof paper, an 8-knife set, the baren, a baren brace, sharpening rouge and its stand, transferring film, instruction, study materials, use of the workshop's tools and facilities, stone seal carving. Each student must purchase their own pigments; the set of 18 bottles of pure colors costs ¥22,000. Long-term courses will try to visit a paper-making village, if possible; depends on the weather, and the schedule of the paper maker. Richard's former student Terry McKenna has opened his mokuhanga studio in scenic Karuizawa. Just over an hour from Tokyo it is located amongst the mountains of Nagano.